I haven’t made pumpkin seeds in forever! As a kid I remember how much fun it was to roast them in olive oil and salt after carving out the perfect pumpkin. Of course, to get the fresh seeds you DO need to carve the pumpkin and clean through all the pulp and seeds. Not gonna lie, it was a little bit of work, but worth it in the end. I’ve been snacking on these suckers all day. The actual recipe is super, super simple. 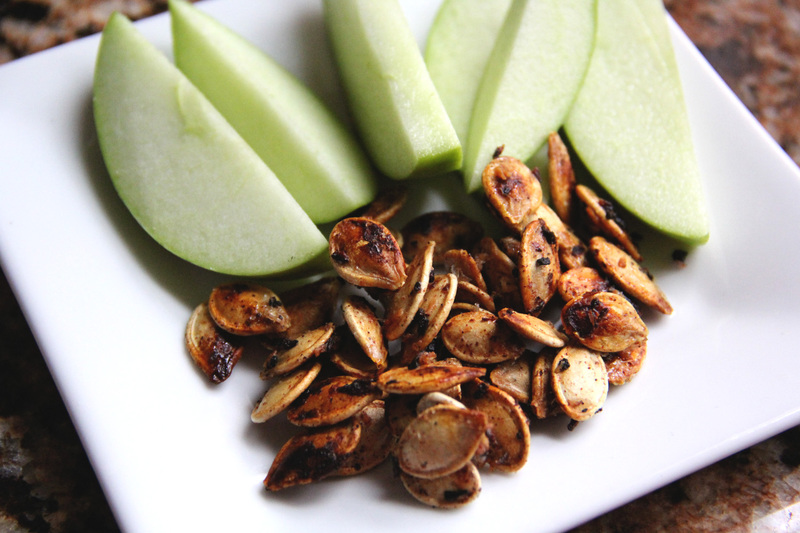 I’d imagine you could make this recipe with pre-bought pumpkin seeds too. Preheat oven to 300 degrees. First comes the fun part (and by fun, I mean not fun at all) – cleaning and separating the seeds from the pulp. This is the most time-consuming part of the entire recipe but it gets much easier from here on out. I found the best way to separate them was to fill a large bowl with warm water and let the seeds float to the top, then skim them out and into another bowl. Once you’ve separated you seeds, lightly dry them off with a paper towel. 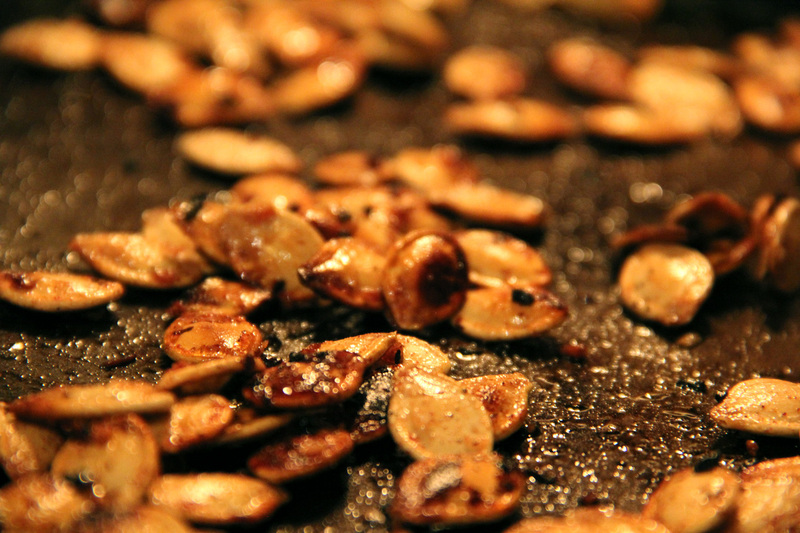 Next, put the coconut oil in a skillet pan on the stove and lightly roast the seeds for about 10 minutes, continually stirring so that they don’t burn. After 10 minutes, take the seeds and empty into a bowl. Add in the maple syrup, cinnamon and sea salt. 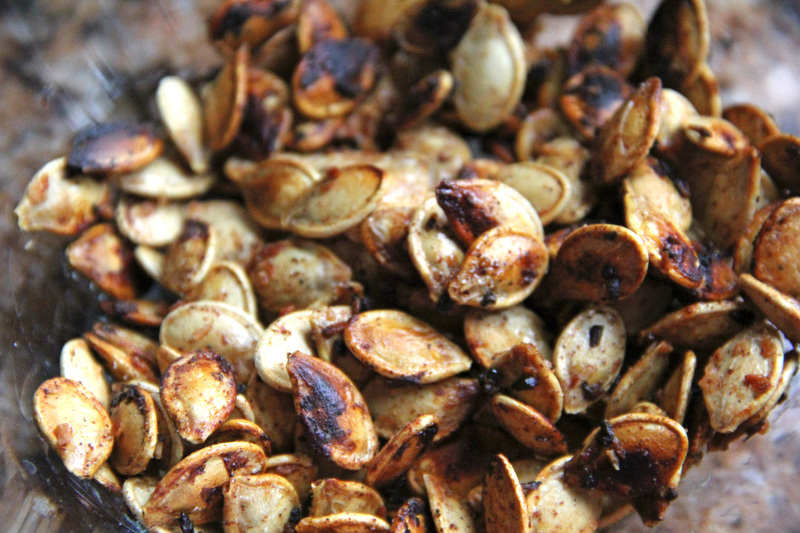 The smell when the maple syrup and cinnamon hit the hot seeds is amazing. I was literally licking the bowl. Sweet, salty goodness. Yum! 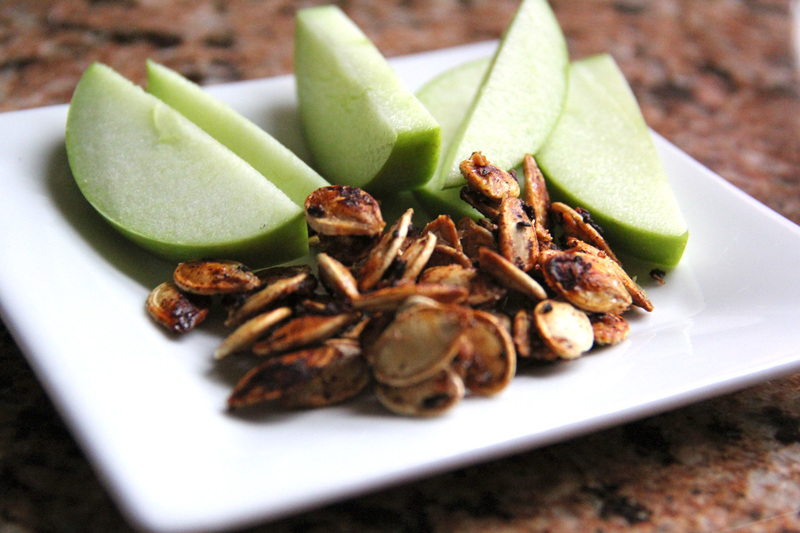 These are such a quick, healthy and filling snack for those who love the nutty taste of pumpkin seeds. I even ate some for breakfast this morning! Nutty, maple-y, salty and spiced. The perfect fall flavor combo. Enjoy!